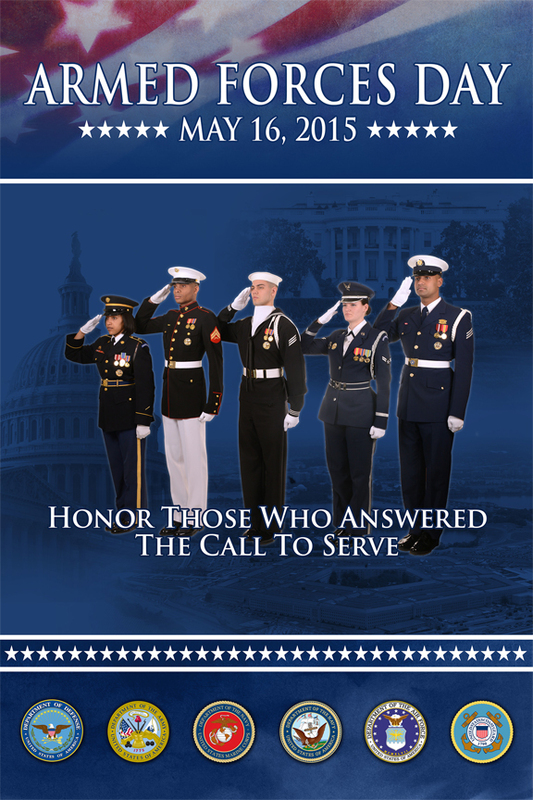 Saturday May 16, 2015 is Armed Forces Day. So: please thank and keep good thoughts for our US service men and women (and their families) this weekend. (Find out more about Armed Forces Day and how to help our sailors, soldiers and marines and their families below). Since 1950, the third Saturday of May has been celebrated as Armed Forces Day: a day to pay tribute to men and women who serve the United States’ armed forces. Armed Forces Day is also part of Armed Forces Week, which begins on the second Saturday of May. It is meant to honor men and women in the US Armed Forces during times of peace (and unfortunately, we’re not there yet) and war. It honors all members of the US Army, US Navy, US Marines, US Air Force and US Coast Guard as well as National Guard and Reserve units. In 1999, the US Senate first passed a designating May as National Military Appreciation Month, which encourages U.S. citizens to observe the month in a symbol of unity, and honor the current and former members of the armed forces, including those who have died in the pursuit of freedom and peace. Along with putting your money to a good cause (see below for A+ rated agencies below that are recognized for excellence in serving our active service members, vets and military families), here’s some ideas from http://www.wikihow.com/Celebrate-US-Armed-Forces-Day. Show your respect, and have a fun family outing while teaching your children how to honor those who protect us at home and abroad. Attend a military air show. We’ve highlighted these before, but we always check to see these agencies have maintained their status and to add new ones. We don’t think these can possibly get too much attention. Members of the military community — veterans, active-duty, reserve, National Guard, or their family members — benefit from several types of charitable associations and organizations. These charitable organizations can provide advocacy, emergency assistance, grants, counseling, and other types of direct and indirect support. The following is a directory of charity associations and organizations. BE CAREFUL WHERE YOU GIVE MONEY. For every legitimate charity, there are scores of con-artists or badly run organizations that waste much of your donation. 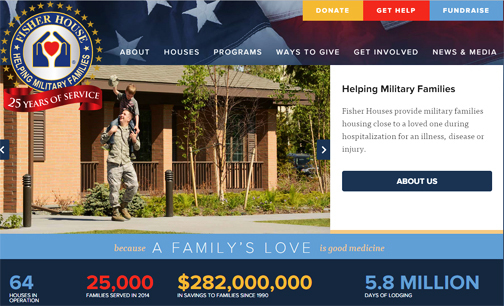 According to their website, “Fisher Houses provide military families housing close to a loved one during hospitalization for an illness, disease or injury.” Actually, they are being modest. Did you know that during the government shut down in 2013, Fisher House was the entity that housed and flew families in to meeting wounded and killed warriers? Did We Miss A Charity You Think We Should Include? If you think we left something important out, please let us know by leaving a comment. These are the ones we’re most familiar with: it is by no means a complete list. We’ll consider all requests and add appropriate ones. Warning: please DO NOT spam this page and if the charity is not 100% on the up and up, note we do report any and all scamsters to Federal criminal authorities. This entry was posted in Make Your Voice Heard!, Other Things We Like, Seasonal and tagged Air Force Aid Society, Armed forces Day, Army Emergency Relief, Coast Guard Mutual Assistance, Fisher House, http://www.militaryfamily.org/, Navy an Marine Corps Relief Society, reputable charities for vets and active service members, Ways to celebrate Armed Forces Day by SolarLightingSmart. Bookmark the permalink.